Latest News > Hurricane Bertha hits UK but the show must go on!! Hurricane Bertha hits UK but the show must go on!! By Chief Pilot Neil Airey - August 2014. 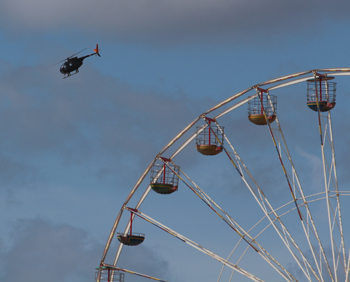 'Huey 509' was scheduled to fly in a display on Monday 11th August 2014. With the remnants of Hurricane Bertha passing through the UK over the two days of the Blackpool Airshow, it became obvious that 'Huey 509' would not be able to fly so 'Loach 011' was offered up as an alternative. 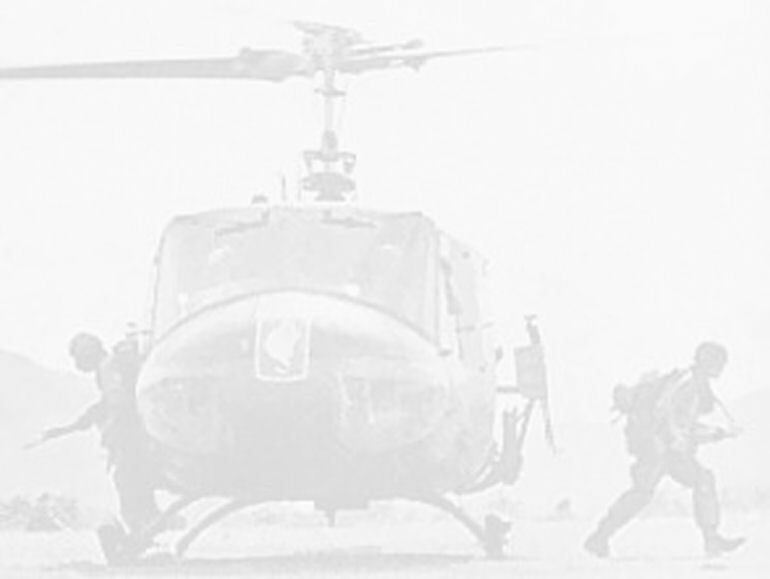 The reason that the Huey was not flown was due to its main rotor system being a teetering head design which is very susceptible to gust effects. 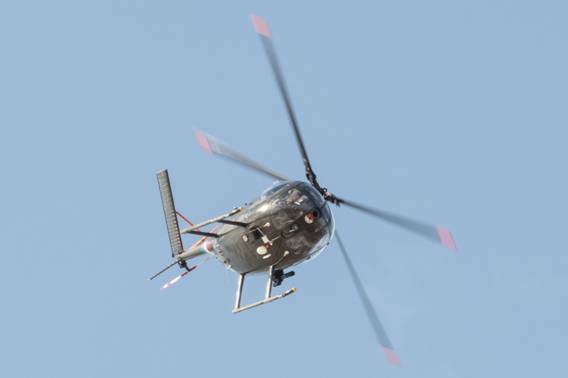 There is a realistic possibility that gusting wind conditions could cause self damage either in the main rotor mast shaft or by a blade contacting the top surface of the tail boom. 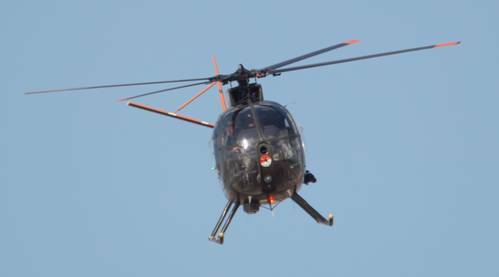 Teetering rotor systems on the Huey family, including the Bell Jet Ranger here, are an early design which work very well but are renowned for difficult handling during rotor shut downs. 'Loach 011' has a different type of rotor system and is OK to start and stop during windy, gusty conditions hence the offer of a display swap! So, I attended the Mandatory Aircrew Briefing on the morning of 11th August 2014 at the Blackpool Hilton Hotel and informed the organisers of the swap option and I'm pleased to report they were more than happy with that! My display arena was in-between North Pier and Central Pier, maintaining a minimum height of 200 ft above the Sea and no closer than 50 M to any person so long as I remained below 100 knots airspeed. When I was cleared to enter the display arena at 15:58 hrs the wind was what we call an 'on-crowd' wind of 45 knots! This means that the wind is blowing you in towards the crowd line which MUST NOT be crossed so I found myself working somewhat hard to achieve this. SAFETY is ALWAYS the first concern and so long as that is not compromised, then all is well. 'Loach 011' coped well with the strong winds and the gusts but my usual repertoire of manoeuvres had to be 'tailored' to allow for the conditions of the day. The wind was a real challenge and all the displaying acts worked extremely well to make it all happen SAFELY. I was particularly impressed with Peter Troy-Davies and his spectacular display in the Calidus Autogyro under very difficult conditions. He was the 'act' before me so I was able to watch him from the holding point north of North Pier. My hat goes off to you Peter for an outstanding feat of skill! After 8 minutes display time, I departed the display arena to the North for the return transit back home to Huey Base. When I landed, I was pleased at how it all went but I do admit to feeling somewhat battered and a little green, like you would feel after stepping off a 'wild mouse' fairground ride. All in all, another opportunity for us to share and display the delights of this unique Vietnam Veteran helicopter to the public. I'm sorry it wasn't 'Huey 509' but I hope this explains why we made the change.